The global two wheeler tires market is expected to exhibit a strong growth over the course of the forecast period. The report on global two wheeler tires has been minutely studied and researched upon by Transparency Market Research (TMR). The market research report presents a comprehensive analysis of the global two wheeler tires market along with an outline of the competition existing among the core players operating in the market. The vendor landscape section includes several aspects of key players such as product portfolio, innovation and developments core strategies, prime personnel, geographical area covered, acquisitions, mergers, agreements, and other financial and non-financial strategies. The presence of leading players is expected to trigger intense competition in the market amongst them making this oligopolistic market. On the other hand, small-scale players are witnessing increasing challenges in gaining hold on the market. Owing to incorporation of advanced technology in these tiress, new comers might face difficulties in venturing into the market. The leading companies operating in the market are Apollo Tyres Ltd., Bridgestone Corporation, CEAT Limited, Deestone Company Limited, JK Tyre& Industries, and MRF Limited, among many others. According to TMR, the global two wheeler tires market is expected to exhibit a CAGR of 4.6% from 2017 to 2026 and is projected to touch a valuation of around US$16939Mn by the end of the forecast period. Based on region, the global two wheeler tires market has been segmented into North America, Latin America, the Middle East and Africa, Europe, Asia Pacific excluding Japan, and Japan. Among these, Asia Pacific excluding Japan is likely to emerge as the core region for the market players to capitalize owing to countries such as Indian and China where the demand for two wheelers is comparatively high. Moreover, as the road infrastructure of India is relatively poor, the aftermarket for two wheeler tires is also high in this country as people go for replacements. 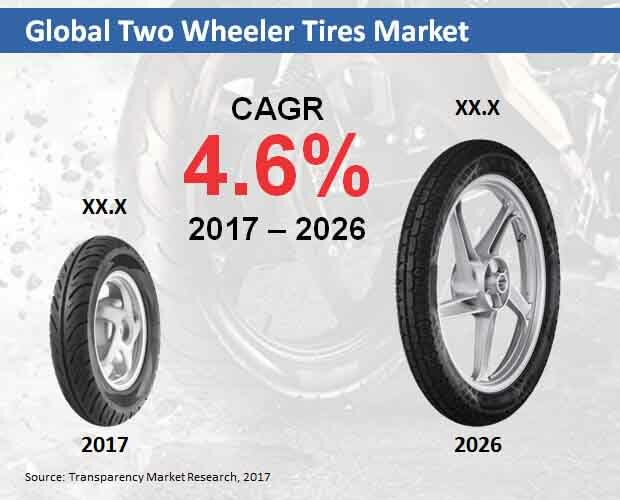 The two wheeler tires market in Asia Pacific excluding Japan is anticipated to reach a valuation of around US$6,084 Mn by the end of 2026. The demand from European countries is also expected to be high owing to government subsidies being provided for tires manufacturers in the U.K. and Italy. On the basis of size, the global two wheeler tires market has been bifurcated into less than 18 and greater than or equal to 18. Between these two, less than 18 is expected to lead the market by the end of the forecast period reaching a valuation of over US$2,460 Mn by the end of 2026. Based on demand category, the global two wheeler tires market has been divided into OEM and replacement. Among these two, the replacement category is expected to lead the market in the long run as the demand for replacement is higher in most of the developing countries. On the basis of application, the global two wheeler tires market has been segmented into street, racing slicks, dual sport, and offroad knobbies. Among these, the application of two wheeler tires is likely to stay higher than the others by the end of the forecast period. Based on vehicle type, the global two wheeler tires market has been classified into motorcycle, scooter, and moped. The use of two wheeler tires is likely to stay high in motorcycles by the end of 2026.